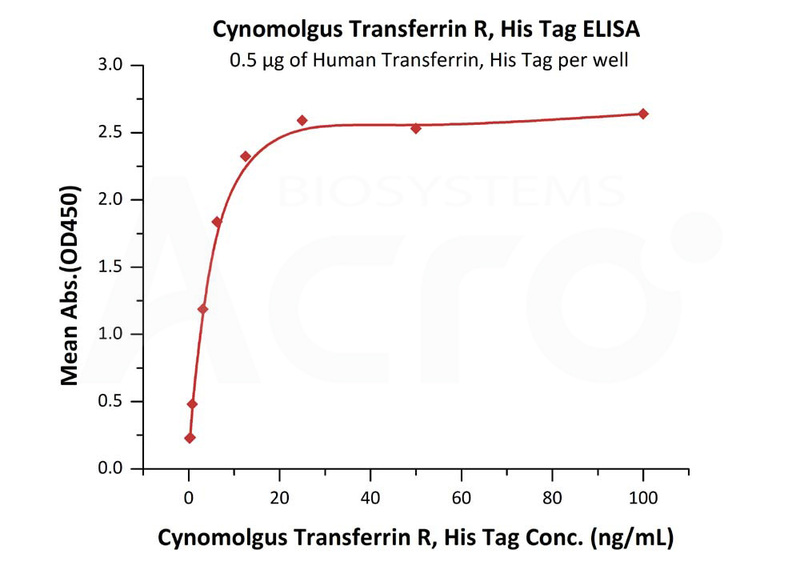 Cynomolgus Transferrin R (TFR-C524a) is expressed from human 293 cells (HEK293). It contains AA Cys 89 - Phe 760 (Accession # XP_005545315.1). The protein has a calculated MW of 77.1 kDa. The protein migrates as 75-90 KDa under reducing (R) condition (SDS-PAGE) due to glycosylation. Cynomolgus Transferrin R on SDS-PAGE under reducing (R) condition. The gel was stained overnight with Coomassie Blue. The purity of the protein is greater than 95%. Immobilized Human Transferrin, His Tag (Cat. No. TRN-H4229) at 5 μg/mL (100 μL/well) can bind Cynomolgus Transferrin R (Cat. No. TFR-C524a) with a linear range of 0.2-6 ng/mL (QC tested). 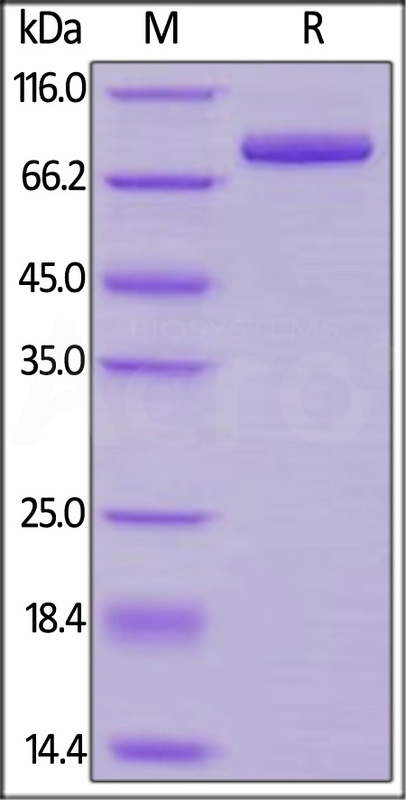 CD antigen CD71 is also known as Transferrin receptor protein 1, TfR, sTfR, p90, TfR1, Trfr, which belongs to the peptidase M28 family and M28B subfamily. CD71 /TFR contains one PA (protease associated) domain. CD71 / TfR1 is required for iron delivery from transferrin to cells. CD71 is a potential new target in cases of human leukomia & lymphoma. CD71 /TFRC / TfR has been shown to interact with GABARAP and HFE. (1) Aisen P., 2004, Int. J. Biochem. Cell Biol. 36 (11): 2137–43. (2) Moos T., 2002, Danish Medical Bulletin 49 (4): 279–301.